Tecmo Koei PS Vita launch title Dynasty Warriors Next plays like a standard Dynasty Warriors title for the most part, but when certain officers clash it's time for a little Infinity Blade style touch screen dueling. Using the touch screen to slash, block, and otherwise decimate powerful opponents is nothing new, at least for iPhone or iPad owners. 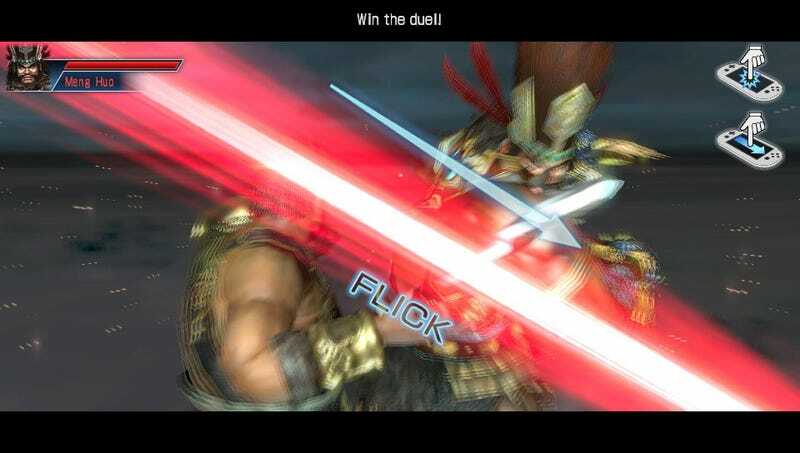 Next month new PlayStation Vita owners get a fresh taste of swipe-and-slash gameplay via Dynasty Warriors Next's duel mode. When activated the game shifts to a first-person perspective (unlike Infinity Blade's third-person view) and players have to touch, tap, and swipe their way through cinematic one-on-one battles. Kinda makes me wonder why there's no Dynasty Warriors game for iOS yet. Until that happens, there's Dynasty Warriors Next.